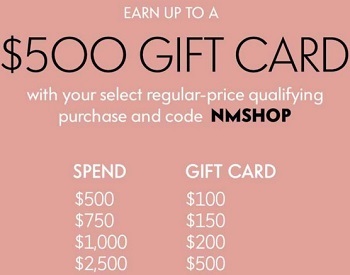 Today is the last day when you can save money with online promo code from Neiman Marcus. Buy more, save more! Spend $500 and get $100 gift card. Spend $750 and get $150 gift card. Spend $1000 and get $200 gift card. Spend $2500 and get $500 gift card. To receive the offer use online promo code NMSHOP at checkout. Offer ends today January 26, 2016! Source of the information is Neiman Marcus. Offer is valid online only at neimanmarcus.com. Your promotional gift card and redemption instructions will be sent within 8 weeks of the promotion expiration date via the email that was used when placing the order. For more information visit the official website.